If you've always thought of a zebra's stripes as offering some type of camouflaging protection against predators, it's time to think again, suggest scientists at the University of Calgary and UC Davis. Findings from their study will be published Friday, Jan. 22, 2016 in the journal PLOS ONE. "The most longstanding hypothesis for zebra striping is crypsis, or camouflaging, but until now the question has always been framed through human eyes," said the study's lead author Amanda Melin, an assistant professor of biological anthropology at the University of Calgary, Canada. "We, instead, carried out a series of calculations through which we were able to estimate the distances at which lions and spotted hyenas, as well as zebras, can see zebra stripes under daylight, twilight, or during a moonless night. Melin conducted the study with Tim Caro, a UC Davis professor of wildlife biology. In earlier studies, Caro and other colleagues have provided evidence suggesting that the zebra's stripes provide an evolutionary advantage by discouraging biting flies, which are natural pests of zebras. In the new study, Melin, Caro and colleagues Donald Kline and Chihiro Hiramatsu found that stripes cannot be involved in allowing the zebras to blend in with the background of their environment or in breaking up the outline of the zebra, because at the point at which predators can see zebras stripes, they probably already have heard or smelled their zebra prey. "The results from this new study provide no support at all for the idea that the zebra's stripes provide some type of anti-predator camouflaging effect," Caro said. "Instead, we reject this long-standing hypothesis that was debated by Charles Darwin and Alfred Russell Wallace." 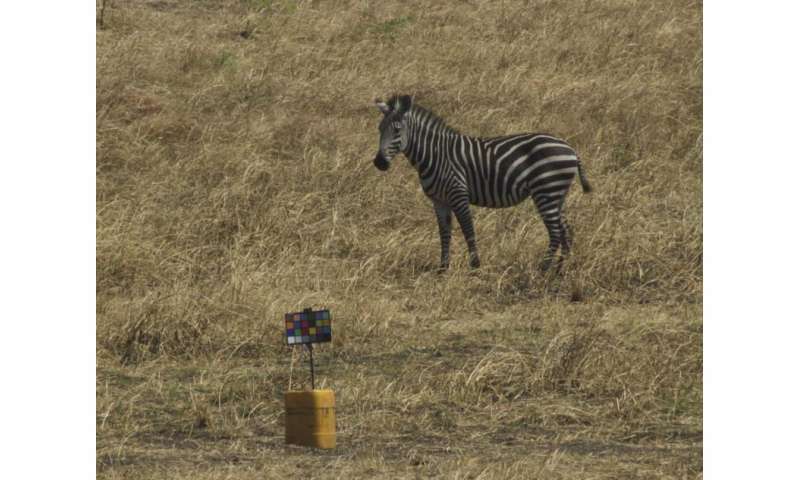 To test the hypothesis that stripes camouflage the zebras against the backdrop of their natural environment, the researchers passed digital images taken in the field in Tanzania through spatial and color filters that simulated how the zebras would appear to their main predators—lions and spotted hyenas—as well as to other zebras. They also measured the stripes' widths and light contrast, or luminance, in order to estimate the maximum distance from which lions, spotted hyenas and zebras could detect stripes, using information about these animals' visual capabilities. They found that beyond 50 meters (about 164 feet) in daylight or 30 meters (about 98 feet) at twilight, when most predators hunt, stripes can be seen by humans but are hard for zebra predators to distinguish. And on moonless nights, the stripes are particularly difficult for all species to distinguish beyond 9 meters (about 29 feet.) This suggests that the stripes don't provide camouflage in woodland areas, where it had earlier been theorized that black stripes mimicked tree trunks and white stripes blended in with shafts of light through the trees. And in open, treeless habitats, where zebras tend to spend most of their time, the researchers found that lions could see the outline of striped zebras just as easily as they could see similar-sized, prey with fairly solid-colored hides, such as waterbuck and topi and the smaller impala. It had been earlier suggested that the striping might disrupt the outline of zebras on the plains, where they might otherwise be clearly visible to their predators. In addition to discrediting the camouflaging hypothesis, the study did not yield evidence suggesting that the striping provides some type of social advantage by allowing other zebras to recognize each other at a distance. While zebras can see stripes over somewhat further distances than their predators can, the researchers also noted that other species of animals that are closely related to the zebra are highly social and able to recognize other individuals of their species, despite having no striping to distinguish them. As the story alluded to, previous studies indicate that the stripes confuse insect predators. This story seems to have been a case of "what they are not for" more than anything else. Perhaps the insects thing, perhaps something new. How is this less believable than a "divine" magician who created it all out of nothing in 6 days 6 thousand years ago? How could he have been there before it all, before space-time, before matter? The above is actually a far more practical scenario, supported by documented evidence that cannot be edited, ie. on kiln-fired clay bricks many thousands of years old..
Maybe it helps them spot dangers by easily eliminating themselves from the equation. When they are migrating and need to cross the street. I remember reading in a book about the brain that an experiment was done on cats, in which they placed a cat in an environment with only vertical stripes on the walls and let it live out its life in there. On dissecting the occipital lobe, they discovered that there was a preponderance of vertical neural arrangements. Same story with the cats in the horizontal striped environments. Their occipital lobe neurons displayed horizontally arranged concentrations. The zebra's environment is replete with vertically arranged grasses. This certainly must create an inheritable mindset as a matter of course. So, while we may not be closer to finding out why the zebra has contrasting vertical stripes, we can be sure of why they don't have horizontal stripes. there is another paper with the same result. Perhaps there is evolutionary pressure to maintain the stripes. A zebra without stripes, even a black one, would stand out like a sore thumb amongst its pack. For this reason it may be more attractive to predators. It would be some kind of weird evolutionary twist - a trait that is arrived at by drift and is then only beneficial because the entire population possess it. Just more Darwinian BS biting the dust. This may a bit left field, but there is the possibility that rather than the stripes being camouflage or visual confusion, they are a motion detector, If zebra were brown, the herd may take a few seconds to notice that one of them has spotted a lion and taken off. Rapid movement of the stripes would be instantly noticed by other zebra even at some distance and give give the herd a couple of seconds advantage and that is all they need. "Why did the zebra evolve stripes? Actually the generic pattern isn't that uncommon an evolution. In the very, very, very..., very distant related okapi (even-toed ungulates vs odd-toed ones), which are diurnal-towards-nocturnal, they proliferate on the legs. "The striking stripes make it resemble a zebra. These features serve as an effective camouflage amidst dense vegetation." [ https://en.wikipe...ki/Okapi ] If zebra ancestors evolved in the more forested and bushy Africa of yore, it may be a frozen in adaptation. Or perhaps the okapi researchers (or even Wikipedia, that claim had no reference) have it wrong. Anyway, a cross species study would help test some of the open hypotheses. There are also fishes and snakes that use b/w stripes for ... mostly camouflage, I think. I would seem to me that one explanation would be that when running away form a predator who has singled out a individual the predator will loose site of its target very easily in a heard with strips. So it is a group level survival attribute. Perhaps expecting a singular "purpose" for zebra stripes is a misconceived notion in itself - striping seems synonymous with wilder, more aggressive species and may simply be an epiphenomenon of a high-geared endocrine system. Patterning generally, across species, is an incidental consequence of more pertinent considerations, but which can nonetheless be adapted for camouflage where beneficial - why are dogs spotted or cats tortoisehelled; or why are tortoises themselves patterned? What benefit is the iridescence of mother of pearl in the pitch black world of an oyster? Maybe stripes look badass because they just are - an inadvertent warning sign, rather than a specialised one, not 'intended' to communicate anymore than a tooth or claw. Zebras were probably engineered for their beauty and elegance. No, they weren't. STFU and go fix yourself a nice strong glass of NaOH solution YOU GODDAMNED XTIAN!!! Amazing how much hate you pack in a single sentence. In my younger days, when I could run/maneuver much faster/better than now, I found that when friends horsing around in the park wore striped clothes of a certain spacing, there was a strobing effect at certain speeds. I thought then that this striping/strobing arrangement must be useful for prey/predators, to assist in gaining even a small/momentary advantage. Eg, when standing still, facing in the direction of a possibly dangerous sound/scent, a Zebra's vertical striping would better camouflage them in the tall savannah grasses. Then if forced to suddenly turn and run, the vertical striping would produce a horizontally-oriented 'strobing' to momentarily confuse the predator about which way the Zebra had turned; and if being chased, the horizontal striping on the up-down bouncing rear of the galloping Zebra would produce a vertically-oriented 'strobing' to momentarily confuse the predator about where/when to lunge/strike. So crazy that so many science articles continue to try to explain the reason or blame of life conditions on the completely unfounded theory of evolution. Please don't mix in your atheist doctrine into these science articles. This may a bit left field, but there is the possibility that rather than the stripes being camouflage or visual confusion, they are a motion detector, If zebra were brown, the herd may take a few seconds to notice that one of them has spotted a lion and taken off. Rapid movement of the stripes would be instantly noticed by other zebra even at some distance and give the herd a couple of seconds advantage and that is all they need. An eye opener. The longstanding hypothesis on anthropogenic global warming could be next. Son of a gun! Ha ha, missed that. I would imagine that these stripes would disrupt how their predators hunt by making it difficult to isolate an individual in a group. This would be especially useful to the vulnerable, like the young, who would blend in standing close to their mother. In addition to the possibilities mentioned in my previous post: a potential advantage against Zebras major predators who mostly hunt at night. In the night-vision image formed in lions/hyenas retina/brain, the Zebra's black-white striping would cause constant breakup of its body outline, even when still/moving slowly while grazing. The 'outline' shape of a Zebra would not resemble anything like it would if it was mostly one color all over, like the other herd animals it mingles with. So predators would more easily lock in on the 'solid silhouette' formed by other animals; and easily miss the Zebras broken outlines; whose black stripes blend with the wavering shadows, and whose white stripes confuse the light-intensity perception/processing within the predators' retina/brain pattern recognition faculties. I remember a study that showed the advantage of the stripes was in how they blended the zebras together when they are running as a herd from pursuing lions. They made it difficult for the lion to get a well-aimed attack, which they need to bring the zebra down. One possibility which could be tested is that the stripes confuse a predator's distance perception as it makes its final leap when close to the zebra. We have all experienced the "crossed-eye" effect when standing close highly patterned wallpaper. If the predator experiences a crossed-eye lock on the zebra's stripes just as it is preparing its final leap it could misjudge the distance and increase the odds of the zebra escaping. Then of course, there is the usual herd hierarchical and mating selection pressures which herd individual interactions may naturally select for certain vivid stripes of a certain inherently beneficial type easily noticed by the rest of the herd, as indicative of healthy genes, robust survivability characteristics and attention-getting/signaling from/to potential rivals (to avoid conflict) and potential mates (to make the female's choice quicker and more potentially successful). The zebra's stripes stave off blood-sucking insects, the secret hides in the polarization patterns of light. It was published by a Hungarian researcher, in the Journal of Experimental Biology, in 2012.